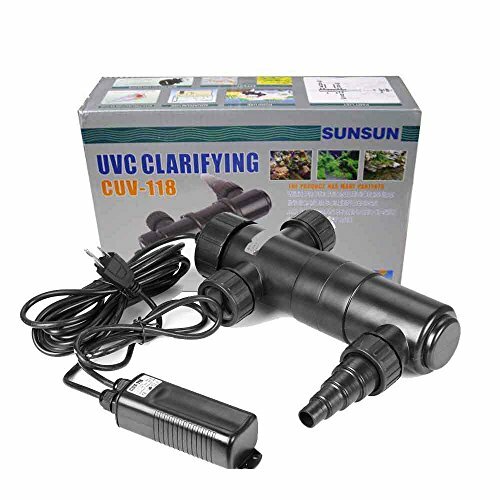 Sunsun CUV-118 UV Sterilizer 18W Light Lamp Clarifier Pond Reef Fish Aquarium by Sunsun at The Net Stores Network. MPN: PET-UVLIGHT-CUV118-1. Hurry! Limited time offer. Offer valid only while supplies last. 1. Compact UV clarifiers help clarify green water - a simple solution 2. Maintain clear, clean water for lasting enjoyment of your water garden 3. If you have any questions about this product by Sunsun, contact us by completing and submitting the form below. If you are looking for a specif part number, please include it with your message. Viqua Sterilight Compatible S463RL UV Lamp for 5 & 6 Gallon Per Minute S5Q-PA, S5Q, S5Q-GOLD Bulb - 1 Year Warranty!